The Extractive Industry Geology (EIG) Conference is the principal event for sharing knowledge, scientific research and good practice in the field of applied geology within the UK minerals industry. For the draft programme and further information please see the 2019 one-day meeting page. Read the first details of the 2020 Conference in Exeter, thanks from Durham and a short tribute to long-standing supporter and friend to EIG, Jackie Swift. At the AGM the new EIG Conference Chair for Exeter 2020 was unanimously voted in. We would like to extend our congratulations to Teresa Brown (Mineral Commodity Geologist, BGS) and current EIG organising committee member / proceedings editor for volunteering to take on this important role. Teresa is the first female to be appointed as Chair in the EIG’s long history. The entire committee is looking forward to supporting her deliver the next conference, successfully. Teresa has been contributed invaluably to the smooth running of EIG over a number of years, well done, Teresa!. Please read the Message from the 2020 EIG Chair. 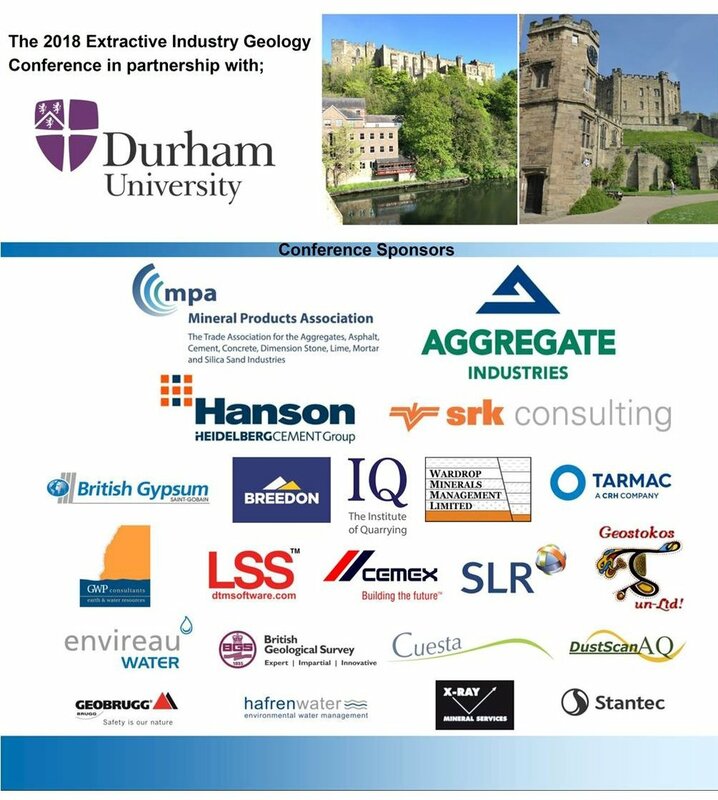 The main EIG event, our much anticipated 2018 conference took place in the beautiful setting of Durham University, with the backdrop of Durham Cathedral just a stones throw from the icebreaker reception and conference dinner held in the castle itself. Over 170 delegates from the UK and International extractive community converged to make the event a resounding success in the best of EIG traditions. If you were a delegate of the conference the committee would be delighted if you could complete the conference feedback survey that has been emailed to you, Thank you. We’ve already had some wonderful comments!. The EIG committee and Conference Chair Nick Horsley would like to thank again to the conference sponsors, exhibitors, contributors, hosts and delegates for making the event such a success. For more information on the recent conference please see the 2018 conference page. If you missed the conference, why not take a look at the final programme. Perhaps you would like to join us and even present at the University of Exeter, in July 2020!. The conference fieldtrips have been summarised on the 2018 fieldtrips page, we are hoping to post a selection of photo’s from them shortly. Fundraising for the Great North Air Ambulance at the Durham Conference. The EIG Committee wish to extend their thanks to all who made donations to our designated charity during through the raffle at the conference dinner in September. The final amount raised was...... £1620, a fantastic effort for a very good cause. 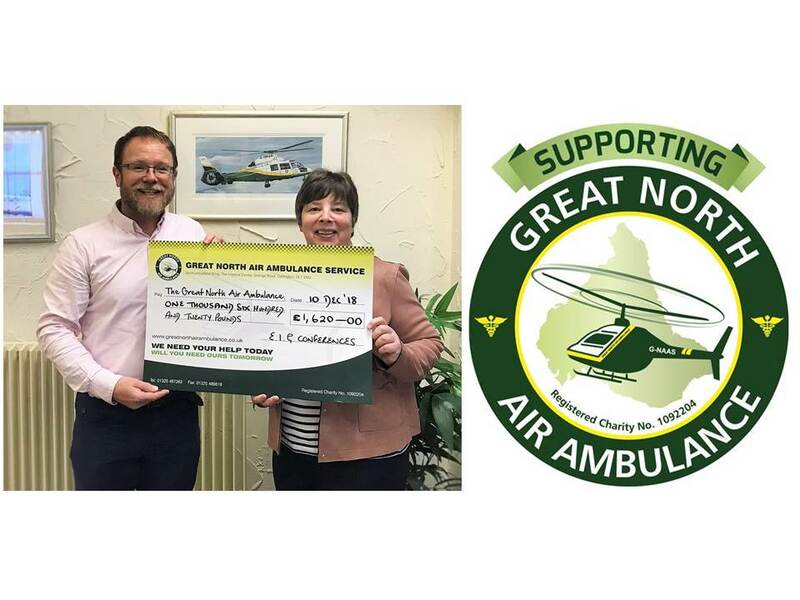 Paul Jennings (Charity & fundraising, EIG) is pictured presenting the cheque to GNAAS. Wondering what the reasons are to attend one of our events? If so, you don’t have to believe what we say, have a look what past delegates think. Take a look at our 2016 Conference summary video and find out why the events mean so much to the industry and the delegates that attend. If so, please contact EIG secretary Clive Mitchell. Membership of the organising committee is open to all volunteers who are interested in the UK’s extractive industry, and opportunities remain to join. The roles undertaken by individual committee members are quite varied and suit a wide range of knowledge and experience. If you would like to know more about the EIG, please get in touch, everyone welcome!. For details of sponsorship at the 2018 Conference please see our dedicated page.